Businesses these days are always seeking tools to reach their customers and expand their base. This is where email software like ActiveCampaign and Constant Contact come in. Both tools tailor their services to meet business and marketing needs. However, the best choice will be determined by individual business needs and prior knowledge. It can also be determined by the willingness to adapt to new software. In comparing both, it’s important to see clearly where each shines or doesn’t. 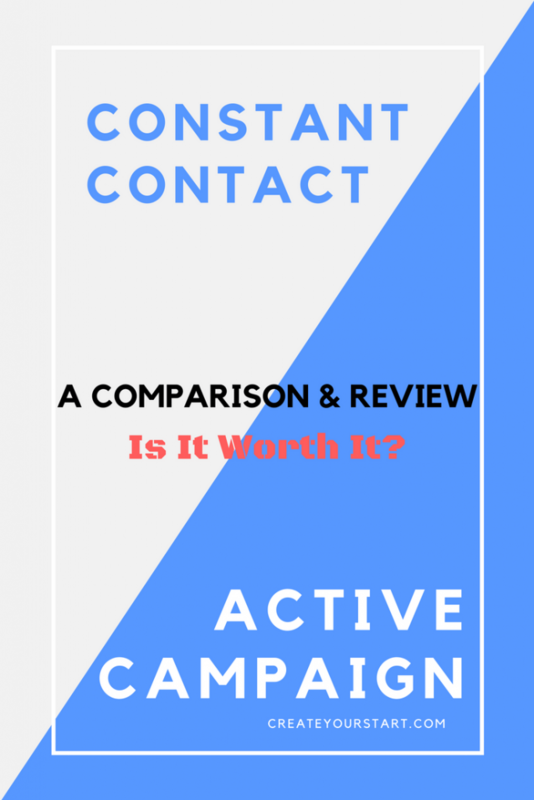 This ActiveCampaign vs Constant Contact comparison review will help you decide which is the best email marketing platform for your business. First, we’ll have a look at what each service offers and how they differ. Then, we’ll compare their use so that you can decide which best suits your needs. Active Campaign and Constant Contact are services that help keep businesses in touch with their customer base. They do this by making mass communication simpler, less time-consuming, and more effective. Both great automation options but in different ways. Both offer support, integration, automation, customization and have tracking and reporting features. The differences are in the details. What is a perfect product for one business, can potentially be a bother for another. Constant Contact is simpler to use and requires mastery of fewer tools. That is to say, you don’t need to be super tech-savvy in order to use it. They also provide tools like an image gallery for those who may not have their own source material. ActiveCampaign is powerful for email outreach but also hybridizes itself with other marketing tools to create fuller marketing campaigns. It requires more time or know-how to fully utilize but allows for much more powerful options if you know how to use it. With time, you’re likely to get better at using this service which would give you more control and allow for more creativity. Both also have various options for integrations, sorting, tracking, reporting and reaching customers. 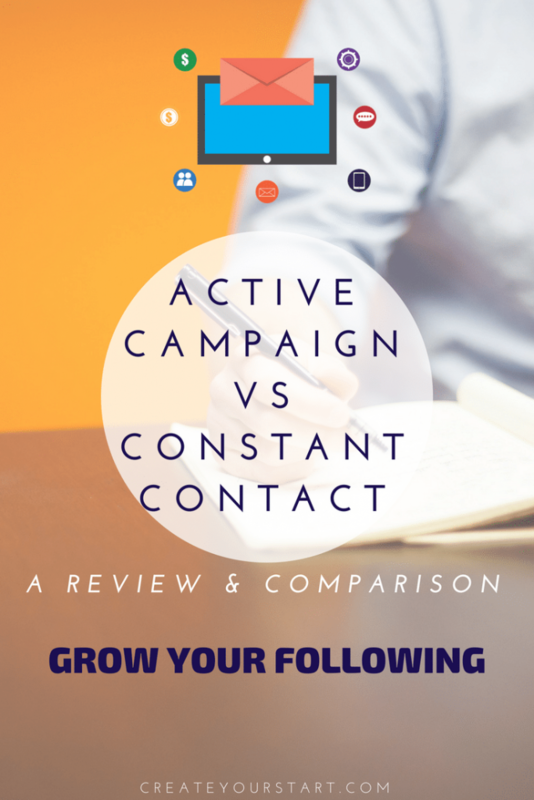 Some prefer the heavily detailed reporting and tracking offered by Active Campaign. Others prefer the simplicity and easy capabilities of Constant Contact. Depending on your personal style, you can choose one or the other. Constant Contact is built with simplicity in mind. 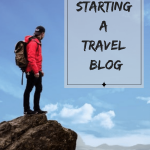 This is especially attractive for freelancers, bloggers and small to medium businesses. With a lean team, there may not be the time or need to dedicate a lot of effort to learn the capabilities of a more powerful tool. That said, if it’s just you and you’re starting out, this service is likely a great choice. If email is a focus (but not the driving focus) of your business or blog, I would advise you to start off with Constant Contact. ActiveCampaign offers more attractive features for businesses interested in advanced CRM tools. They also offer lead tracking and tailored email contact based on previous customer interactions. For a business ready to go well in depth in customer analysis and funnel building, Active Campaign may be a better fit. It’s a lot more sophisticated and comes with more bells and whistles. Keep in mind that if it’s just you, you might need to get some help with this service. 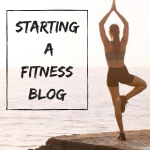 You might want to consider hiring someone or allocating more time for personal training until you get really good at using it. Constant Contact delivers emails as well as event registration and promotion, Facebook fan promotions, and includes social media tools to assist with sharing. It also has a built-in image library and image editor. 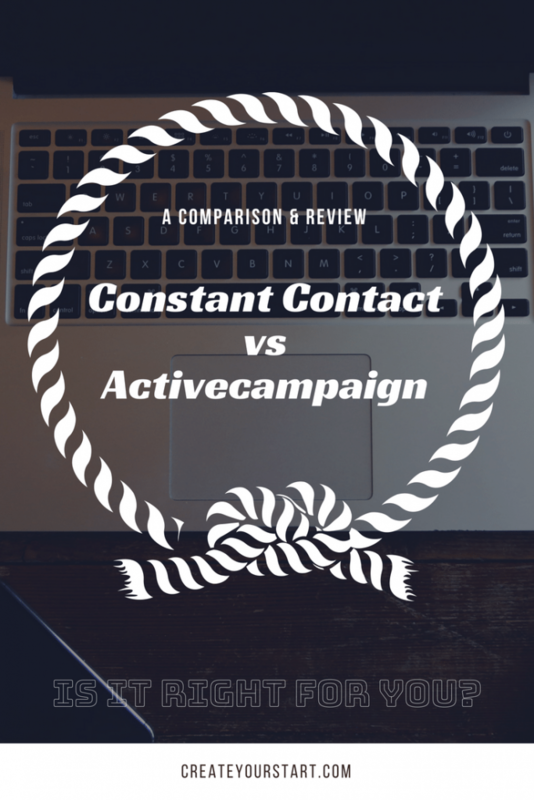 ActiveCampaign doesn’t just manage contact through email. It has an integrated feature for SMS outreach as well and allows for smart responders based on information and keywords from client-generated contact. It also offers free email templates and drag-and-drop design features. The bread and butter of ActiveCampaign is its in-depth autoresponder triggering and sequencing. Active Campaign gives businesses the ability to feature video and live e-commerce data to emails. Another bonus that appeals to business owners is it allows for unlimited contacts. They keep a ‘sky is the limit’ type of attitude toward a business building. To better organize customers, both include tools for list building and contact management. Both offer operating system support for Android, Windows, web-based operating systems, iPhone, iPad, and Mac. The difference in OS support is that Active Campaign allows businesses more options. They include Linux and Windows Mobile. Both boast easy integration with hundreds of third-party apps. Do note that Active Campaign openly lists more. More often than not, these apps are more recognized services. On the other hand, Constant Contact does offer a marketplace to ease integration. In a nutshell, both integrate well with platforms and apps such as Instapage, Facebook, Wistia and Leadpages. Active Campaign has a few more integrations, however. Constant Contact allows businesses to configure their customer tracking. You can place follow-up contact after customers take certain actions. For example, clicking on a link advertising a special. Businesses can view customer interactions, such as clicking a link or viewing a page, to edit their marketing for the target audience. ActiveCampaign has more powerful customer tracking so businesses can ensure the most successful customer outreach. The lead scoring feature allows full customization for data points on which to base interaction. It also includes site tracking and event tracking. Because of these features, you can get to know the customer and their habits with minimal effort. For a business owner that has limited experience with mass customer outreach, Constant Contact has great appeal. This is because of its simple interface. They have designed the entire layout with simplicity in mind. 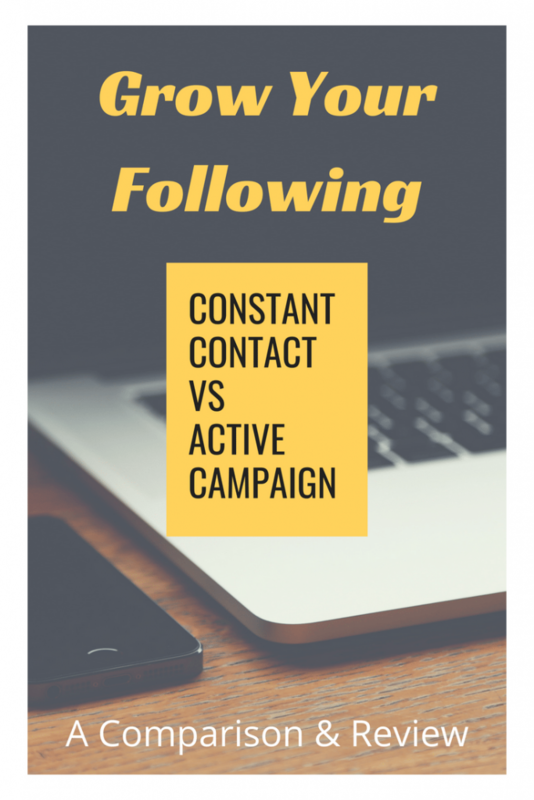 For those just beginning with email marketing or email sequences, or for those with limited time and resources to invest in learning a new powerful tool Constant Contact is a great solution. It features an easy to use image editor as well as an image library. These can be helpful for any businesses that don’t have time to track down images for marketing campaigns. In case you don’t have a team and need to learn everything by yourself, this is a great solution. You’ll still be able to accomplish a lot but without extra stress, as you’ll learn quickly. This service is quite straightforward. ActiveCampaign is more complex use but does offer training for those wanting to get a tutorial. It also offers training for those who want to get a more fluid process for using it. 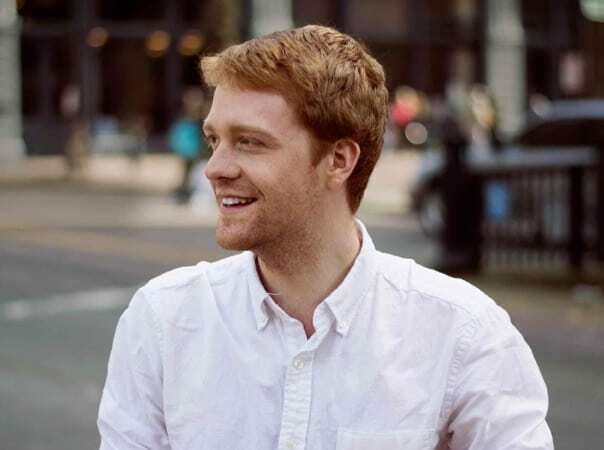 I was impressed the first time I used ActiveCampaign that they called me to better understand how I would be using the tool, and to answer any questions I had. They also offer live support for any questions that may arise while customizing the tool’s use. Once set up and any customization is complete, I’ve found it takes little checking up and ongoing effort to maintain. Once you have set it up and determined the customization and automation, the process becomes much easier and intuitive. The reporting and tracking are often the easiest. In fact, it is one of the most beneficial features offered. It even includes options to graph customer tracking, reporting, and interaction. For many businesses that have regular profit and progress meetings, this is a tool that eliminates a lot of extra desk time. If you have a team, you should really consider Activecampaign. It will give you more freedom of customization, and extra features and options. Having more than one person use it and learn how to operate will accelerate the process by a lot. Both services allow month to month billing without requiring contracts, and both offer discounts for longer-term commitments. Constant Contact (in keeping with the simplicity of its interface) offers just two plans: Email and Email Plus. These can be paid monthly or there is a 15% discount for prepaying six or 12 months (at the time of writing). This could be a big draw for businesses testing the waters with automated email marketing. Both plans include the option for up to 500 contacts. ActiveCampaign offers four pricing plans. They offer a fair discount on all of them if you sign up to pay yearly, rather than monthly. While its most basic plan is significantly less expensive than Constant Campaign’s, the highest tier plan can cost more. This is due to the expansive options and virtually unlimited use. All plans also allow for unlimited contacts. Something to consider is how many people you’ll be reaching out to. If you’ve got more than 500, go for the unlimited plan. Otherwise, if you’re trying to save on cost and have fewer emails to send, go for a more basic option. It’s important to know what others have experienced and think about both of these services. We’ve done the research for you and pulled up information regarding both the good and bad aspects. This way, you’ll know what to expect before you make your choice. Constant Contact users rave about contact sorting and being able to plan advertising campaigns. 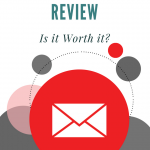 Many reviewers like being able to see how customers interact with marketing emails sent out. They say it helps them understand which marketing campaigns are more effective. By far, they mention about the simplicity and quick set up. Constant Contact reviewers sometimes do have an issue with the price point. At least, in comparison to similar services. Even for their higher tier service, Email Plus, customers were dissatisfied. They complained that for the price they’d paid, they were allowed only 500 contacts. A few other complaints are that welcome emails cannot be tailored to different segments of contacts. They also dislike that the Constant Contact logo shows prominently on the bottom of all emails sent out. Customers using ActiveCampaign rave about the level of customization available for marketing. They also like that they can target specific segments of customers in their contacts. In general, they find that time invested in learning to use the program is more than worth it in the response and sales growth they experience. Once they had set up their automation, very little was actually required of them to continue their marketing campaigns. Users of Activecampaign strongly recommend using the learning resources provided. They encourage fellow users to become comfortable setting up the features. In fact, most users had trouble coming up with something they disliked about using the service. The most common complaint was the lack of landing pages within use of the service. This is easily solved people have found, through the integration options ActiveCampaign has. You will need to weigh these against the needs of your business. Also consider the size of your business and needs. Not just for your business, but for your customers that keep making it possible. Do you have any experience with either service? Drop us a comment below and let us know what you think. Would you recommend it? Was it easy to learn how to use it? Do you work alone or in a team? What do you love/ hate about it? We’d like to hear your thoughts!